A girl for all seasons: Cast the first stone. 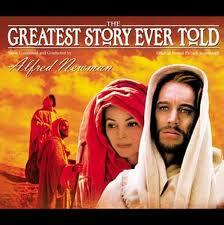 As it is approaching Holy Week, we were looking at the DVD of "The Greatest Story Ever Told" in class. There had been a battle of wills as they had wanted to watch "The Passion of the Christ" and I shreiked in horror! They couldn't understand why I wouldn't show them an 18's film when they are only 11 and 12. "But Miss, we've seen it before. Our parents let us watch it." My reply was that they should be put in care if their parents are that irresponsible. OK, that response may have been in my head, but I was very close to saying it aloud! I was in Abu Dhabi when that film first came out. Being a country of censorship, surprisingly it was shown. But for one night only....and at midnight! So of course we all wanted to see it! We felt very decadent heading into the cinema to see something that was "wrong"! I think I lasted about 15 minutes and then I had to leave. I don't do blood and guts very well! The men sheepishly turned away. "That was was very clever of him," some of the class responded. "But Miss, couldn't Jesus cast the first stone?" Mmm, I think they're missing the whole point!! !